Today has been eventful and many websites have decided to join the SOPA blackout, if the ‘Stop Online Piracy Act’ is passed then the internet will never be the same, it will be changed for the worse many are saying. Well Android users can now Blackout SOPA with a Boycott app. 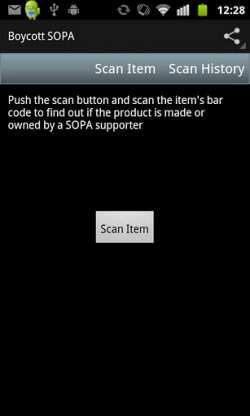 The Android app is called “Boycott SOPA”, and it allows users to avoid SOPA supporting products to show displeasure with the bill, and this will help get it voted down. This application is totally free and can scan barcodes, once users have done this it will identify if products are either intimately related or created by SOPA supporting companies. It lists over 800 brands and companies; it identifies goods from the companies that support SOPA. It is intended as an aid to identifying such products but should not be relied upon. You should carry out your own check in case of any product this app indicates is a product of a company supporting, the app will receive an update that will add more features according to the developers. For more information please visit the Android Market to install Boycott SOPA, please do let us know what you think about SOPA and the app of course. a young internet user fighting for rights.